Biography* � According to the 1850 census, Mary Ann Elizabeth Culpepper was born in South Carolina. Her parents, John Jefferson and Catherine (Bell) Culpepper, have not been located in the 1820 census but were probably living in Edgefield District, SC near Barbary Bell, Catherine (Bell) Culpepper's widowed mother. Presumably, in 1823 or 1824, Mary Ann Elizabeth would have moved to Georgia with her parents where her father is noted in Monroe Co., GA taking part in the 1827 Georgia Land Lottery. He is next noted in an 1829 deed living, presumably with his family, in Upson Co., GA. Mary Ann Elizabeth is first noted as a 10-15 year old female in the household of her parents in the 1830 census of Upson Co., GA. Mary Ann Elizabeth's father was still listed in Upson Co., GA when he took part in the 1832 Gold Lottery and since Mary Ann Elizabeth's younger brothers were born in Georgia according to census records, the family probably remained in Upson Co., GA until at least 1835. Some time after this, possibly in 1835 or 1836 when the Francis G. and James Culpepper families moved to Alabama, or in 1837 after the marriage of Mary Ann Elizabeth's older brother, John Jefferson Culpepper moved his family to Chambers Co., AL. One female, 15-20 years of age was noted in the John J. Culpepper household in the 1840 Chambers Co., AL census, presumably Mary Ann Elizabeth. 1820 is based on the 1850 census. The tombstone has 1823. Page ? ?, Lew Griffin Transcription, Chambers Co., AL. John J. Culpepper, 2 M5-10, 1 M40-50, 1 F15-20, 1 F40-50. 1819 based on the 1850 census. The tombstone has 1812. Photo provided by Mary Lillian Culpepper Pierce. Robert Jefferson Culpepper was known to his great-grandchildren as "Great Grandpa Jeff" or "ole e Pa." His parents were recorded in the 1830 census of Upson Co., GA and this is where Robert is presumed to have been born. The 1900 Soundex for Alabama shows Robert J. Culpepper in Albertville, Marshall Co, AL with a birth date of July 1828 but since he was not noted in the 1830 census this can probably be discounted. By 1840, Robert had moved with his parents to Chambers Co., AL where he was noted as one of two males 5 to 10 years of age in the household of John J. Culpepper. Robert emerges in Chambers Co., AL marriage records in 1848 and by 1850 was listed with his wife in the 1850 Chambers Co., AL census living next door to his sister and near his parents. Robert J. and Louraney (Cardwell) Culpepper hosted the wedding of his younger brother, William Washington Culpepper, and her younger sister, Ferby Cardwell, at their home 23 Dec 1855. Their father, John Jefferson Culpepper, was the second bondsman. At some point after this, Robert J. Culpepper apparently moved his family to Randolph Co., AL. He is noted in land records purchasing 39.86 ½ acres in the SE 1/4 of NE 1/4 of section 3 in Township 22 Range 10 of Randolph Co., AL. Unfortunately, the date is illegible. The land appears to be just north of the 159.46 acres of land which Robert's father, John J. Culpepper, obtained 22 Aug 1850. Robert and his brother, William, and their parents were noted living next to each other in the 1860 census of Almond P. O. District, Randolph Co., AL. 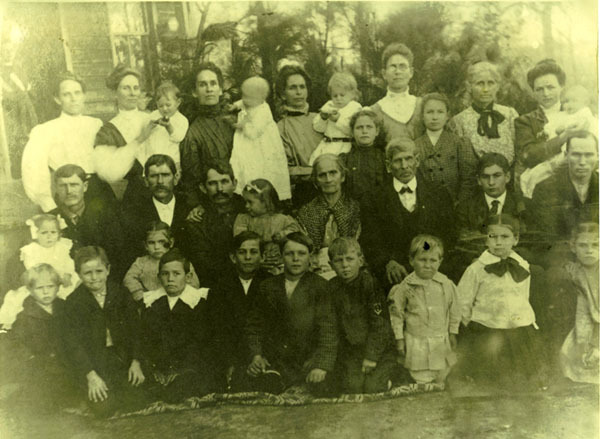 After the war, Robert returned home and he was noted with his wife and children in the 1870 census of the Louina P. O. District (now Wadley), Randolph Co., AL. His brother, William Washington Culpepper, was still living next door and his parents were also living nearby, all apparently on the same land that they were on before the war. By 1880, Robert had apparently moved his family to Clay Co., AL R. J. Culpepper was noted with his wife and younger children in Wesobulga District, Clay Co., AL in 1880 census records. According to an article from the Guntersville Advertiser 10 Oct 1916, Robert J. Culpepper and his wife had moved to the Sand Mountain area of Marshall Co., AL 28 years previously. This would have been approximately 1888. A son, John James Culpepper, located his family in what is known today as Albertville, Marshall Co., GA. Other members of the extended family settled across the county line in Joppa, Cullman Co., AL. Unfortunately, the 1890 U. S. census burned and so it is not possible to see exactly how everyone was situated at the time. What is known is that, according to her obituary, Mrs. R. J. (Louraney Cardwell) Culpepper died in Joppa, Cullman Co., AL in 1894. After the death of his wife, Robert apparently split his time at the residences of his children. Robert J. Culpepper was noted in Albertville, Marshall Co, AL in the 1900 census. He was listed as having been born Jul 1828 although, since he was not noted in the 1830 census and was listed in later census records as being age 19, 30, 40 and 49, the 1828 reference can be discounted. Robert Jefferson Culpepper's daughter, Arkansas (Culpepper) Williams, and her two young sons, "Larkis" and "Charlie," were living with him. In 1910, Robert was still living in Marshall Co., AL was noted in the Marshall Co., AL census living with his son, John J. Culpepper. A great-granddaughter, Mary Lillian Butler Pierce, wrote, 19 Jan 1979: He carved & made fancy furniture, beautiful beds among other things. He had a collection of old guns.... He had a hobby of keeping a diary, of the weather and happenings of the day.... My Grandpa Jack [John James Culpepper] & family along with ole e Pa & family all moved here to Sand Mt. from Randolph or Clay [the family was in Clay Co., AL in the 1880 census] in covered wagons in 1883.... Ole e Pa Jeff... walked lots of miles almost every day, even in his 80's.... One more thing about ole e Pa Jeff, he carved and made spinning wheels to spin yarn then weave it into yarn for cloth in those days." Mary Lillian Butler Pierce added in s 23 Apr 1993 letter that "Robert Jefferson Culpepper carved and made furniture in his younger days - beautiful pieces - and each piece painted black." 20 Jan 1979, Mary Lillian wrote that her great-grandfather had lived with her grandparents in the same house that she is living in now: Lola Martin said ole e Pa Jeff's room was upstairs, steps are steep here and only heat he had up there & light was a lantern. Scratches are still on the wall up there where he would strike a match to light the kerosene lantern. Was a stacked chimney in the middle of the house, heat from it helped keep the walls of that little room warm. Said he never had a cold or was sick in winter. Mary Lillian Butler Pierce added in a 23 Apr 1993 letter: Lola Martin was right stairs were steep, and still are. Scratches are still on the wall. I painted or painted part of that little room up stairs a few yrs ago, and it's hard to find the scratches now. According to a great-granddaughter, Mary Lillian Butler Pierce, Robert Jefferson Culpepper received a monthly pension of $15.00 from the State of Alabama for his Civil War service. In a 3 Sep 1994 phone conversation, Mary Lillian noted that her great-grandfather would buy a gallon of "white whiskey" with 15 cents from his Confederate Pension money and add a teaspoon of it to his breakfast coffee "instead of cream" to make "Lace Coffee." The following is from the 10 Oct 1916 issue of the Guntersville Advertiser published in Guntersville, Marshall Co, AL: R.J. Culpepper is 86 years old and enjoys good health for a man of his age. He has lived on Sand mountain 28 years [arriving circa 1888]. Uncle Jeff as he is familiarly called, has 8 living children, 53 grandchildren, 98 great grandchildren and 3 great great grandchildren, which is, we believe, getting pretty close to the record in this county. Marriage Records 1833-1861 of Chambers County, Alabama Vol I, Genealogical Society of East Alabama, Inc., 1974.
p 70 by Wm F Grady J. P.
Service record of Robert Jefferson Culpepper submitted to Culpepper Connections by Linda Cushing (#174) who received it from Carole Watson. FHL Film 1254007, National Archives Film T9-0007, Wesobulga, Page 39A. Robert J. Culpepper, AL4230__.371, Authority Date: 20 May 1862; Signature Date: 18 Feb 1898, Huntsville Land Office, 40 acres. NWNE part of Sec 8, Township 9-S, Range 1-E. Huntsville Meridian; Cullman Co., Alabama. Although the obituary clearly gives her date of birth and death and calculates her age at death, marriage and census records indicate that she was probably born before 1834, probably in 1832. If Louraney had been born in 1834, she would have been 14 years old when she married, not impossible for the times, but unlikely since no parent gave permission for the marriage based on the marriage record. Also, two years later, in the 1850 census, Louraney was listed as being 18 years old which would suggest a birth year of 1832. In the 1860 census, she age was listed as being 27 years of age, which, depending on when the census was taken, could still support an 1832 date of birth or an 1833 date of birth. In the 1870 census, her age was given as 39, which would suggest an 1830 or 1831 year of birth. Finally, in the 1880 census, Louraney's age was given as 45. This would suggest a date of birth of 1834 or 1835. Louraney was probably born in 1832. P 413 No. 437 (Lurena 18 GA in hh of Robert Culpepper). A son, Louis Alford Culpepper, wrote to his grandson, R. A. Morgan 11 Oct 1942, that "My father William Washington Culpepper was born near Fredonia [Chambers Co.], Alabama." Unfortunately, in census records, William Washington listed his own place of birth as Georgia although his parents probably moved to Alabama when William Washington Culpepper was still an infant. William Washington's father, John Jefferson Culpepper, was recorded with his family in the 1830 census of Upson Co., GA and he was still in Upson County when he drew a lot in the 1832 Gold Lottery of Georgia and this is probably where William Washington was born. However, at some point after William's birth, possibly in 1835 or 1836 when John Jefferson Culpepper's brothers, Francis G. and James Culpepper, moved their families or in 1837 when, William's older brother, John J. Culpepper, married, William's father moved his family to Chambers Co., AL. This is where William was noted as one of two males age 5 to 10 in the household of John J. Culpepper in the 1840 census. William emerges in census records living with his parents in the 1850 census of Chambers Co., AL. His sister, Elizabeth, and brother, Robert, were living next door. Shortly after this, William married in Chambers Co, AL. Apparently, however, his first wife died because in Dec 1855, William married a second time to the younger sister of his brother, Robert's, wife. William's father was the second bondsman. However, shortly after this, William and his second wife and his son by his first marriage moved to Randolph Co., AL where the first child of William's second marriage was born in 1857. William W. Culpepper was recorded in the Almond P. O. district near Louina (now Wadley) in the 1860 census of Randolph Co., AL. William's son by his first marriage, John, was recorded living next door with William's parents. After the war, William Washington Culpepper appears to have returned to the same land where he was living in 1860 and he was noted in the 1870 census of Louina P. O. district (now Wadley), Randolph Co., AL with his second wife and their children. William's son, John, was still living next door with William's father, John Jefferson Culpepper. William's brother, Robert, was his other neighbor. According to p. 112 of Historical Records of Randolph County, Alabama 1832-1900 compiled by Marilyn Davis Barefield from the 12 Feb 1875 edition of the Randolph Enterprise "W. W. Culpepper" of Beat 8, Township 21, Range 10 was to have his land sold to the highest bidder on 1 Mar 1875 to pay his taxes. This land appears to have been north of the land where William was noted in census records. And William remained in Randolph Co., AL after this since he was recorded there with his wife and younger children. In 1950, a granddaughter of William Washington Culpepper, Mrs. M. A. 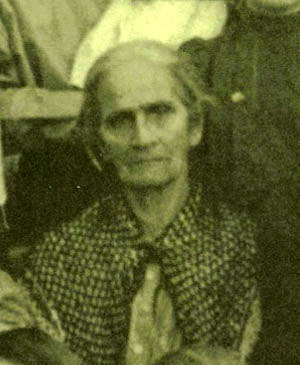 (Inez Culpepper) Champion, is known to have sold land south of Wadley, Randolph Co., AL which is known to have been granted to or purchased by "William Culpepper" in 1850 but this is presumed to have been William Henry Culpepper since William Washington Culpepper would have been too young. But it is not known if this was the land that William Washington was living on when he left for Marshall Co., AL. According a 1916 Guntersville Advertiser article, in 1890, William and his wife moved to the Sand Mountain area of Marshall Co., AL near where William's brother, Robert, had already settled. Although the article indicates that William and Ferby remained there the rest of their lives, they are not found there in the 1900 census and were apparently off visiting their son, Louis Alford Culpepper, in Bell Co., TX when the census was taken. By 1910, William and Ferby were back in Alabama where they were noted in Marshall Co., AL census records. District 19 and A Half, Chambers Co., Alabama; Roll M432_2; Page 413B; Image 825. William Culpeppert, 15, M, GA.
Service record of William Washington Culpepper submitted to Culpepper Connections by Linda Cushing (#174) who received it from Carole Watson. Washington Culpepper, Secretary, Harmony Lodge #3 in Marianna, 1870. Tax Assessors Records of 1890-93 (page 18): W. W. Culpepper. widow Marina may have original -- Billy sent me a a paper copy in the 1970's. Greg Culpepper <e-mail address> supplied a good copy of the original. Pherby Culpepper, Wife, F, Wh, 75, md2-54yrs, GA/GA/GA. Mary Culpepper, 1 M0-5, 1M5-10, 1 M30-40, 1 F10-15, 1 F20-30. Daniel P. Culpepper's Orphans, Sealeys District, Talbot Co., GA, drew lot 975/19/3 in what became Paulding Co., GA, 1832. Nancy C. Culpepper and David Cooper on 2 Dec 1836 in Upson Co., GA.
Vol 1 p 239 25 Jul 1851 issue. Photographed* say 1855� He was photographed say 1855 at Taylor Co., Georgia. Biography* � According to Rev. 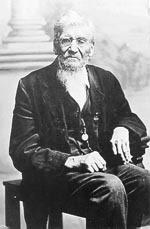 John Butler Culpepper, a son, when James Marion Culpepper joined "FREE-MASONARY" in the the Autumn of 1847, he was described as 5 ft. 7 in. tall, weighing 118 lbs, dark complected with blue eyes, the left arm shorter than the right and the right eye slightly smaller than the left. Rev. John Butler Culpepper also wrote the following account of his father's life: James Marion Culpepper was born February the 1st 1823, in Baldwin County Georgia, in his father's home on the "three mile hill," which afforded a magnificent view of the country for miles, and also a fine view of the capital, located then at Milledgeville. The star of ill luck must have been shining at the time of his birth, for his whole life was a fight against odds. When a baby a fall from his nurse's arms dislocated his left shoulder which gave him permanently a short arm. His father died before he was three years of age, but not until he had lost the lovely home and handsome property. John William, the grandfather, offered them a home, which his mother took for a while. They were given to understand that they could live there so long as desired. John William said he would be to his daughter-in-law a father and the children should be the same as his own, only they would not inherit any property, as their father received all that would come to them. He however promised that the three children would be given a good education and enough that they need not want. After four years in this home, things not being pleasant and being offered a home by her brother, who was a widower, she accepted over the protest of her father-in-law, who told her "if you go, taking the children with you, you nor they can ever come back under my roof. He kept his word. A year later this brother married again and was unable to keep them longer. Thus at the early age of eight years there was thrown upon James Marion the burden of earning a living for his mother, older sister and a baby brother. God never made a more resolute boy. He hired out to work when he had to tip-toe to reach a man's plow-handles. This was the beginning of a life of toil for others, which ceased only with age and infirmity. While a mere lad he became noted as a farmer and was the youngest over-seer in Georgia entrusted with large plantations. He was converted while still a boy, united with the Methodist Episcopal Church that later in the South became the M. E. Church South. He lived a true Christian life in spite of the pains of poverty, the ravages of disease, the shock of misfortunes (for he made and lost three), the dogs of war, destructive moves, change of profession and flight of years. Early in his married life he read medicine, took medical lectures in Atlanta, Georgia [p. 228 of History of Peach County specifies that he "graduated from the Atlanta Medical School"] and then became a country-practitioner and pursued the "healing art" among a very poor and needy people up to within a few months of his death. 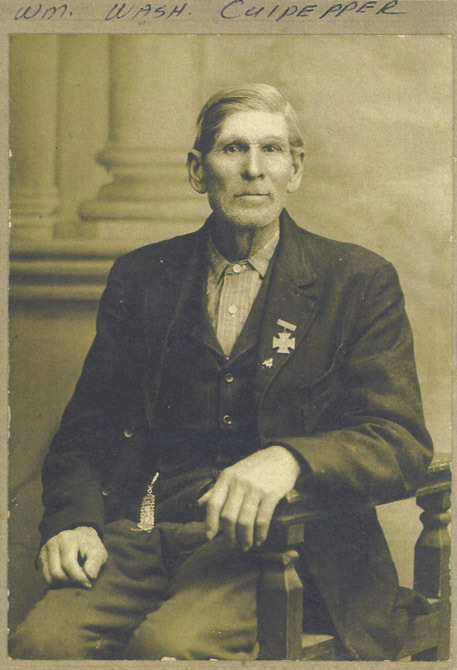 James Marion tended the wounded during the War between the States and in the closing hours of the War he slipped home. He came at night only to be challenged by a voice: "Now you stop right thar Sir." It was the colored man he had left to watch after the family. He was still on guard. J. M. Culpepper was noted as a physician with his wife and six children, in Oglethorpe, Gatlins District, Macon Co., GA in the 1870 census. He had real estate valued as $1,100 and personal property valued at $1,000. 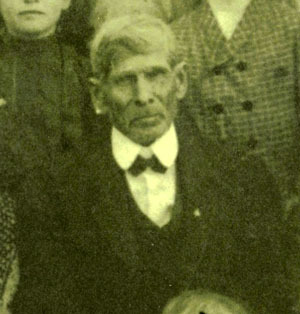 James Culpepper was recorded with his wife and son Josephus in the 1880 census of Macon Co., GA. Younger children such as Nancy Caroline and George Bright Culpepper have not been located in this census and a 43 year old "Amacy Culpepper" born in Georgia was listed in the household with three children between the ages of 8 and 16 that have not been identified. 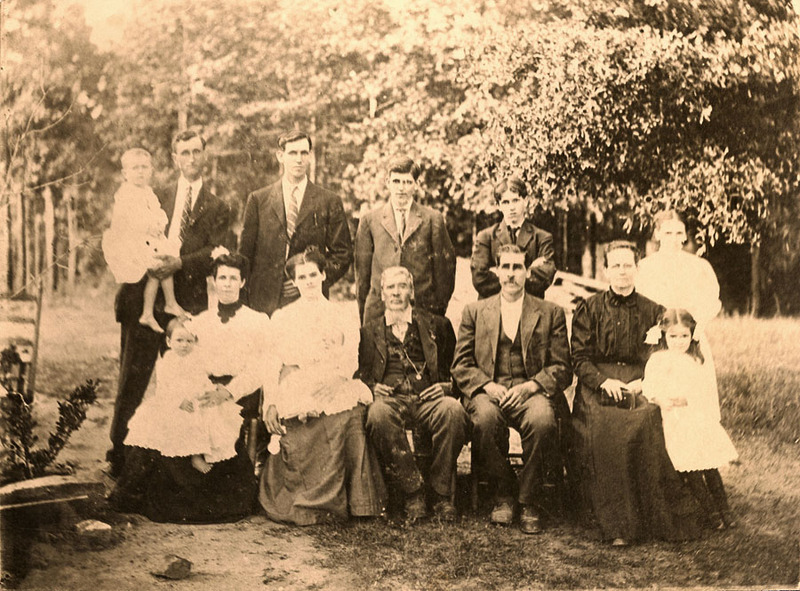 Perhaps the younger children of James Marion Culpepper were off visiting relatives while this family visited with their parents. Marion County Dec Term 1856. Present Daniel Worsham, Ordinary Presiding. James M. CULPEPPER petitions for letters of Guardianship for the persons and property of Susan F, John B. and Augustus L Culpepper, minors of said James M. Culpepper. first term of each year an account. Statement of account of doings of James M. Culpepper Guardian for Susan F, and Augustus for the year 1856 to date Feb 14, 1857. James Marion Culpepper is listed as a state senator elected from Taylor Co., GA in "They Tarried in Taylor(A Georgia County)" by Essie Jones Childs page 12. On page 281 of the same book is Dr. James M. Culpepper with the following information. Mary Culpepper, 1 M5-10, 1 M15-20, 1 F30-40. p 2 had 29 Jul 1844 and JB Culpepper packet had 28 Jul 1846. 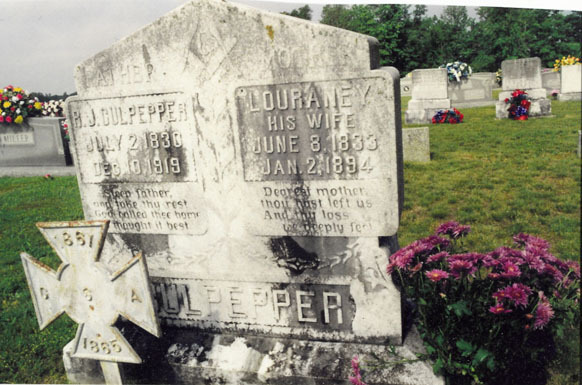 James Culpepper and Lucinda C. Daniel on 28 Jul 1844 in Talbot Co., GA.
Martha J. Culpepper, 8/12, F, GA. The Taylor County News and Butler Herald, Butler, Taylor Co., GA.
Golden Anniversary Announcement, Mr. and Mrs. J. M. Culpepper, Tuesday, July 31, 1894, Page Three. Biography* � Mrs. John (Dorothy Culpepper) Wingfield preserved a 25 page typed manuscript "ONE FAMILY - CULPEPPER" written by her grandfather, Rev. 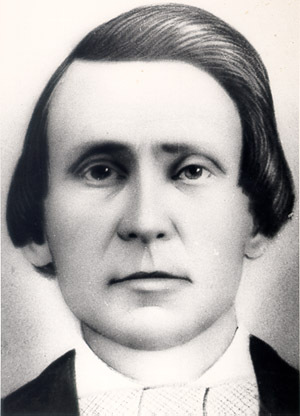 George Bright Culpepper, who noted: My father, James Marion Culpepper, married Lucinda Brooks O'Daniel on Sunday morning, July 29, 1844, in Talbot County, Georgia. They rode the same horse to campmeeting that morning, where my mother heard the first Methodist sermon she had ever heard. She was converted under that sermon, on her wedding day. My father was 21 and my mother was 18. The maiden name of my grandmother on my father's side was Coxley [Corley? ]; and on my mother's King. The blood of the Pierces on my father's side and the blood of the Gordons and Kings on my mother's side flows in my veins and in the veins of my children and grandchildren. My father and mother became the parents of four sons and four daughters. These and their children and grandchildren will make up the balance of this writing. The following excerpt is from p. 228 of the History of Peach County: Lucinda Brooks [was] the daughter of Wilson and Rebecca (King) O'Daniel and a cousin of General John B. Gordon. Rebecca was the daughter of Captain Charles King, a member of the Provincial Congress for South Carolina in 1775, and his wife, Charity Pennington. Charity's father was Captain Isaac Pennington of Pennsylvania and Virginia and the son of the emigrant, Edward Pennington (1667-1711). Edward, who founded a family in Pennsylvania, was the grandson of Sir Isaac Pennington, Lord Mayor of London in 1642-1644. Biography* � John Francis would only have been a couple of months old when his father died. He was apparently listed with his mother, Mary (Corley) Culpepper, in the 1830 and 1840 census records but in 1850, his mother was living with her daughter Caroline and Caroline's husband, David G. Cooper. John F. Culpepper was not listed in the household and an 1850 census record for him has not been found. Rev. George Bright Culpepper wrote in "ONE FAMILY - CULPEPPER" a 25 page typed manuscript completed 8 Oct 1942: My uncle, John Francis Culpepper, was twice married but left no children. His wifes were sisters. He died in Cleburn, Texas, after 1900. John Francis had apparently moved to Texas by 1853, when he was mentioned in a letter written by his grandfather, John Culpepper, as having "gone West." John Francis has not been found on the 1860 [there was a "J. F. Culpper" in Cass Co., TX in 1860] or 1870 census, but served in Company G, Morgan's Regiment, Texas Cavalry, during the Civil War. According to his Confederate pension application, he moved to Cleburne, Johnson County about 1873. He inherited the Culpepper trait of longevity, living to be 91 years of age. To the Honorable County Judge of Johnson County, Texas. "John F. Culpepper, who has been visiting his brother, Dr. J. M. Culpepper, leaves for his home in TX." Rev. George Bright Culpepper in "ONE FAMILY - CULPEPPER" written 8 Oct 1942 noted: My uncle, John Francis Culpepper, was twice married but left no children. His wives were sisters. He died in Cleburn[e, Johnson Co.], Texas, after 1900. John F. Culpepper was listed in the 1900 census of Johnson Co., TX. His adopted son, Luther Lockett, (Nov 1883 TX) was living with him. In the 1910 census of Johnson, Co., TX, Luther L. Culpepper, was listed as the head-of-household and John F. Culpepper was noted living with his adopted son. Betty Lee Collins Hale copied the following obituary from Cleburne Daily Enterprise for Thursday, 28 Dec 1916: John F. Culpepper Dies Here Yesterday The death of John F. Culpepper, a beloved and aged Johnson County pioneer occured at Price's Chapel yesterday morning at 11:45 o'clock. The funeral was held this afternonn at 2 o'clock Rev. Mr. Nelms conducting the service at Price's Chapel. "Uncle Johnnie," as he was lovingly called by his numerous friends, is not survived by any children of his own, but by Luther Lockett, an adopted son whom he greatly beloved and to whom this loss will be a very sad one. The Enterprise extends sympathy to the bereaved son, to whom the aged pioneer, who had reached his 91st birthday represented one of his dearest earthly ties. The Cleburne Morning Review for Thursday 28 Dec 1916 provided the same information adding that John Francis Culpepper had lived in the community for 40 years and that "Mrs. Culpepper" had died 25 years ago. 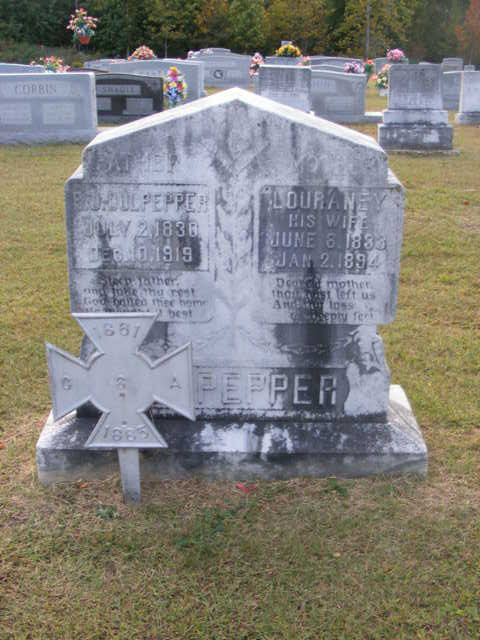 Grantee: John F. Culpepper; Patentee: John F. Culpepper; 23 Nov 1858; 320 acres; Cass Co., TX. L. Culpepper, 17, M [sic], AL. Linda Mearse, compiler, Confederate Indigent Families Index, Texas State Library and Archives Commission. J. F. Culpeper, Davis Co., TX. David Steele, Boarder, M, 28, S, Ireland Ire Ire, Well Borer. Luther L. Culpepper, Son, M, Nov-1883, 16, S, TX GA AL, Farm Laborer. John F. Culpepper, Father, M, 84, wid, GA SC SC. John Francis Culpepper, Johnson Co., Dec 26 1916, 28415.